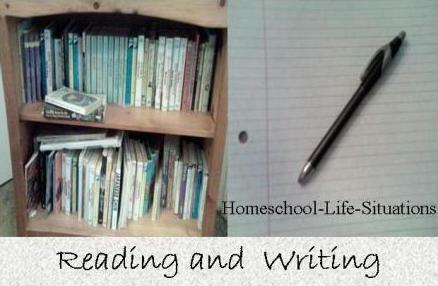 Homeschool language arts involve learning to read and write. It is all about communication. We learn to read and listen so that we can understand what other people say. We learn to write so that we can tell others our views. Here are some activities and ideas for teach your child skills in English. There is some evidence that a child needs to have some basic motor skills before he can learn to read and write. A child also needs to be able to hear different sounds before he can learn to read. When my children were young we made animal sounds. We woofed like a dog and meowed like a cat. Rhymes are also good for teaching children to hear different sounds. Stories and reading out loud is a fun homeschool language arts activity. I started by reading to my children when they were able to sit up. Reading out laud can help children learn to read and write. We also read nursery rhymes. Nursery rhymes and predictable books can help us determine if our children are ready for reading. If my child could provide the right word in the story I would start pointing out other sounds. If my children seemed interested and were able to remember some sounds I would start teaching reading. Homeschool Book Lists - Here is a list of our favorite books that we have enjoyed. There are picture books, classics, and Christian fiction. Homeschooling with Literature - Use fiction, biographies and other great books to teach history and writing. Reading aloud can continue throughout your school years. You can expose your child to different genre that they would not read on their own. Through good literature we can develop shared experiences. Most parents start their homeschool language arts program with reading. I know that we did. For most of my children I started formal reading instruction when they were five. Some parents start teaching reading earlier. I started formal reading instruction with phonics. There are several that are good. I like a program that uses a multisensory approach. When you are teaching letters I think that it is important to see the letter, trace the letter, and say the sound. Best Phonics - lists programs that I have used and liked. From books, internet resources, and do it yourself there is a program for you. Reading Log - what to include on a log for homeschoolers. Reading Comprehension - how to teach reading comprehension. In homeschool language arts you will want to teach the mechanics of writing. Children will need to learn how to form letters on paper. They will also need to English grammar to write well. Children also need to learn to spell. Next they will need to put thoughts onto paper. Most children like to do creative writing. They can learn to write stories and poems. It is also important that our children learn how to write essays and reports. To learn grammar and writing we can buy curriculum. I have used several writing programs through the years. Copywork - I like to make my own copy work pages. Here are some ideas for making your own worksheets. Printing and Cursive - ideas for when and how to teach handwriting. Teaching Spelling - Review of the curriculum that I have used. Making a Spelling List - Ideas for making your own spelling list. Writing a Short Story - discuss the elements of a short story before your child begins to write. Story Starters - a list of 100 story starters. Writing Prompts - a list of characters, settings, and plots to help your child write stories. Writing Curriculum - Read about the programs that we have used. Graphic Organizers - Read about how we use charts in our writing. Then download some graphic organizers for your children. Want to know more about how to teach reading to struggling readers? The site learning-disabilities-reading-tutor.com has a lot of information about teaching children who have difficulty learning to read. When you are consistent most children learn to read and write.